Paul Capon’s 1954 standalone The World at Bay was the 26th juvenile science fiction novel published by the John C. Winston company. Professor Elrick has long suspected that Poppea, the third world of the dark star Nero, is inhabited. The Professor also believes an invasion from that doomed world is imminent. Alas, aside from his loyal teenaged assistant Jim Shannon, few believe Elrick. Instead, skeptics insist that the objects flying in formation from the Nero system toward Earth are only meteors of some sort. Once the objects arrive at Earth, a wave of radio silence begins to spread along the terminator. Elrick was right, but the price of his vindication may be humanity’s doom. Clues suggest that the aliens are using some sort of gas or dust cloud to subdue the regions that have gone silent. By sheer dumb luck, Jim has discovered a trove of Great-War-era gas masks tucked away in a laboratory cupboard1. Better yet, he manages to remember the masks before he can succumb to the gas that is silencing radios (and humanity) across the planet. Of all of Great Britain’s inhabitants, human and otherwise, only Jim, Elrick, Elrick’s beautiful daughter Ruth, and prickly librarian Boothwaite remain conscious. Jim, Elrick, and Ruth waste no time getting captured by the Poppeans who are even now wandering London’s streets. Boothwaite evades the aliens. The trio manage to get their captors talking. The aliens prove unexpectedly chatty and amiable for alien invaders. In the meantime, Boothwaite takes advantage of his freedom to find a working radio. He sends to the Americas, now the only part of the world not under Poppean control, everything he knows about the invaders and their sleepy dust. The Poppeans tell the captured trio a doleful tale of life on a world orbiting a slowly cooling star. With their world almost at the point where oxygen would liquefy, the majority of the aliens felt they had no choice but to decamp for the much smaller, much warmer Earth. Fearing rejection if they tried to negotiate for land at the Earth’s poles (the only regions cold enough for them), and rejecting the option of simply wiping humanity from the face of the Earth, they decided the prudent course of action was to conquer and negotiate from a position of strength. It’s a simple plan and it does not take much time for it to fall apart. Not only have the aliens misread human psychology2, not only is their meagre population stretched to its limits trying to carry out their scheme, but Boothwaite has succeeded in warning the Yanks. The Americans are prepared for the alien. What the aliens, and the humans for that matter, could never have predicted is that letting Jim and his friends light their cigarettes in the command ship would expose the poor aliens to an incapacitating narcotic…. The creative team behind this novel (and of the Winston SF series as a whole) was an interesting one. In addition to being an author, Paul Capon was a film editor and head of ITV’s film department. Winston editors Cecile Matschat and Carl Carmer were both respected authors in fields seemingly far removed from science fiction. I wonder what drew them to edit this series of books? More info re Winston SF can be found here. Why am I interested in a series that may sound unremarkable, even for its time? B) I am reorganizing my ebook collection using Calibre, and have just now discovered the cover browser and cover grid options. At which point I realized that none of my Winston SF novels had the original covers. I’d pulled the entire collection from Gutenberg and the Internet Archive, for free. Free is good, but it did not include cover art. Calibre helpfully slapped on some placeholder art. Ugh. This would not do. Ignoring the dreary common sense that advised me to do paid work, I found and downloaded the correct art for each book. 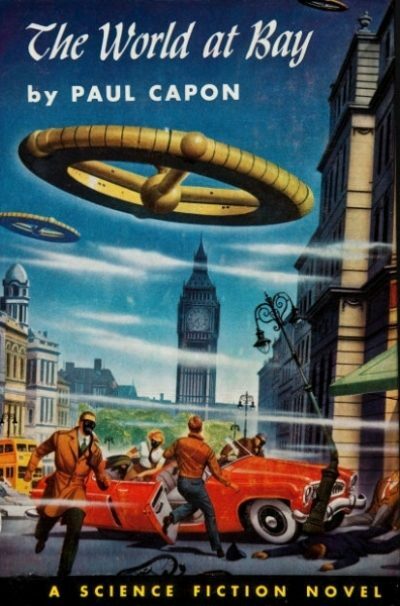 When I came to A World at Bay, the Alex Schomburg cover, like Proust’s madeleine, evoked memories of past pleasure. Vague memories. I had to reread the book to sharpen them3. Just as the Twayne Triplets tried to be educational, so too did the Winston books. Each (well, at least all the ones I read) were provided with a short essay expounding on some scientific subject vital to the plot. In the case of A World at Bay, that subject is radio astronomy, which the novel calls radaroscopy and the essay “blind or daylight astronomy.” The essay’s author (name not noted anywhere I can see) is filled with enthusiasm for radio astronomy’s potential; too bad he confused radio astronomy with radar astronomy. 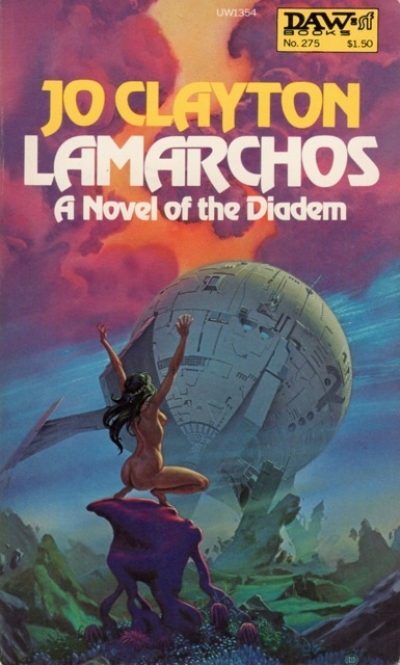 The novel itself, while set in the far off year of 1977, draws on astronomical models obsolete since the early 20th century. Ah, well. Perhaps Nero isn’t actually a star, but a brown dwarf. It’s hard not to feel sorry for the Poppeans. They face extinction and are dealing with as best they can. Their invasion of Earth is carried out as humanely as possible. While there are fatalities, there are probably fewer during the entire invasion than occurred in any given month of George W. Bush’s awesome Middle Eastern adventure. Even when forced to execute prisoners, they hope to do this as painlessly as they can4. I also pitied poor Boothwaite. Yeah, he is something of a contrarian skeptic and prickly nitpicker. Nobody likes him. He’s resigned to it. Even after he saves the world by radioing America, he expects to be forgotten once Jim and company share their amazing adventures. Which consist mainly of getting captured and then thoughtlessly provoking the invaders. Ruth starts out by insulting their translator with an unduly frank assessment of the being’s physical charms. The party gets the alien leader and his retinue stoned out of their minds on tobacco, then inadvertently hijacks the spacecraft containing said leader and retinue. By the time the Poppeans decide to disintegrate their prisoners, any sensible reader will agree this is probably the wisest course of action. But wisdom has come too late. Vapid, razor-tongued Ruth, dotty Elrick, and unremarkable but ineluctably present Jim survive because the aliens have found other reasons to reconsider their invasion. The World at Bay Is, very much to my surprise, back in print. It can be acquired here (Amazon) and here (Chapters-Indigo). 1: Jim guesses that the gas masks were used for an experiment involving noxious gases, which in turn suggests that the university was too cheap to spring for fume hoods. Given the stories my father told about MIT’s 1950s version of lab equipment, I find the notion that a university might prefer to risk killing a lab’s worth of researchers rather than pay for proper equipment entirely plausible. 2: Well, that’s Elrick’s take on the matter. He’s the same guy who could not persuade the world that a formation of objects flying directly from Poppea to Earth was a collection of spacecraft, so it’s possible he’s not an expert on human nature. 3: I did remember that the book was set in London, which led me to mistakenly conclude it was published by a British publisher. It never occurred to me it might be a Winston. 4: Even as a known unknown threatens the Poppeans with calamity, the aliens steadfastly hew to their own laws. Other beings may treat their constitution as a sometimes thing but not the Poppeans.